One of this summer’s most eye-catching additions to Talley Student Union is a student-designed system of bins, pipes, fish and lettuce that showcase one of the state’s fastest-growing agriculture practices. In mid-June on the building’s main floor between Talley Marketplace and the food court, NC State Student Centers, NC State Dining and the student-run Recirculating Farms Club unveiled an 800-gallon aquaponics system featuring a tank of up to 15 fish as well as two shallow planting containers that will grow tomatoes and salad greens in water and without soil. The aquaponics display in the Talley Student Union will soon be home to up to 15 fish as well as hydroponic produce. 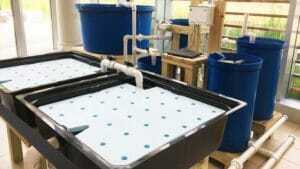 Aquaponics is a closed-loop food production method in which fish and plants are grown together. Water is recirculated between fish tanks and soil-less plant beds that hydroponically grow crops. The wastewater from the fish is routed to the plant beds, where the crops absorb nutrients while also filtering the water for recirculation back to the fish tanks. Depending on the system design, the process can be zero-waste and requires minimal daily maintenance. In addition to being student-built, the display will be student-maintained by the club’s members and other students interested in monitoring pH levels, temperature and water quality. “It is exciting for Talley to have this exhibit, which will educate students about a sustainable agriculture practice that is growing in popularity. Displaying this technology supports the university’s land-grant mission and complements the mission of the student centers to support student activity and encourage learning,” said TJ Willis, associate director for NC State Student Centers. The display is funded by the NC State Sustainability Fund, which is generated by student fees and distributes grants for campus sustainability projects. A 2015 alum of NC State’s applied ecology program, Begue started the Recirculating Farms Club in October 2014 as a graduate student, and the club was awarded the grant for the display in May 2015. Begue and fellow recent graduate Connor Dorsch have been involved in every aspect of the system’s design and construction. 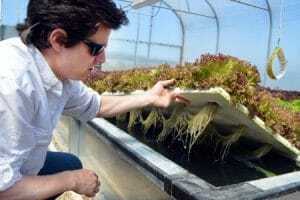 Though Dorsch completed his studies in agricultural science in May, he said aquaponics doesn’t require a traditional agriculture background and, in fact, benefits from multidisciplinary perspectives. “This display system can bring multiple disciplines together and might make headway [in advancing this technology],” he said. NC State alum Paul Begue shows the root structure of plants grown hydroponically in the university’s aquaponics demonstration facility off Lake Wheeler Road. In addition to raising awareness of aquaponics, club members hope the display is integrated into student courses or research projects. Designed to be mobile, the system will be in Talley until October when it heads to the North Carolina State Fair to educate more people about the technology. “We’re excited that the aquaponics system is going to be in Talley for a while. As new students come to campus, this sustainable closed-loop system will be one of the first things they see and learn about,” said Dr. Lisa Paciulli, advisor for the Recirculating Farms Club and a faculty member in the Department of Biological Sciences. Whether the system’s harvest will end up on campus dining hall plates has yet to be decided. University Dining has previously used NC State-grown hydroponic lettuce and farm-raised fish on its menus, and chefs are interested in the system’s capacity to grow herbs. “University Dining is always looking for ways to promote and use local food, and the prospect of integrating more campus-grown food is exciting,” said Chris Dunham, NC State Dining’s sustainability coordinator who also works with the campus Agroecology Education Farm to grow produce for dining halls. What happens when proteins that kill cells as a defense mechanism decide to not kill cells? An NC State study reveals the answer. Researchers predict 13-16 named storms will form in the Atlantic basin during the 2019 hurricane season, 5-7 of which may become hurricanes.